The Shape Memory Alloy (SMA) Deicer uses cutting edge technology to autonomously detect and remove ice from helicopter blades. This deicer provides an efficient solution for rotorcraft applications providing superior erosion resistance. IDI developed the system in collaboration with the NASA Glenn SBIR program. The deicer is made from a durable Nickel Titanium alloy that has the ability to change shape when subjected to an appropriate temperature change. 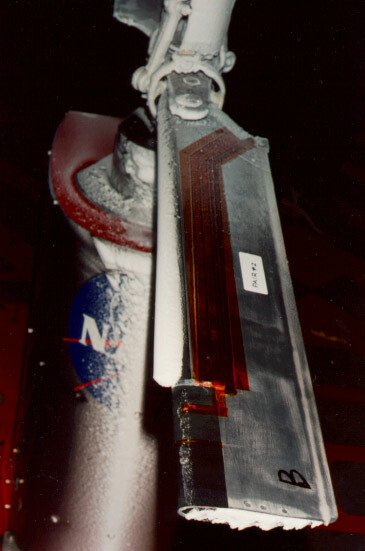 The deicing action is analogous to a conventional thermal expansion except that it is enhanced to the levels needed to remove ice. It can be activated by electrical current or can be passively powered from heat transfer energy due to the formation of the ice itself. Material processing techniques developed at IDI have produced unique SMA material configurations capable of satisfying rotorcraft deicer performance requirements. Energy estimates indicate substantial savings over existing electro-thermally powered deice systems, with much improved durability and erosion resistance.